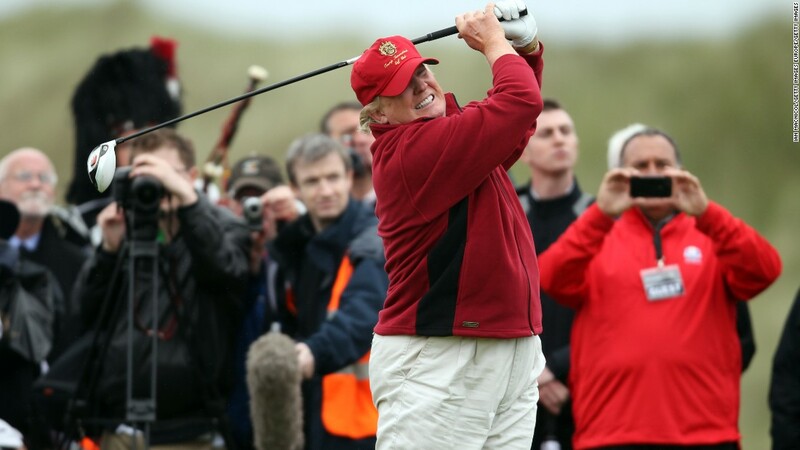 Washington (CNN) If a president golfs in private — and the White House refuses to comment — did it ever really happen? President Donald Trump hit the links at Trump National Golf Club in Bedminsiter, New Jersey, over the June 10-11 weekend, according to a golfer who also played the course and took a video of the President. That video is the only reason the public knows Trump was golfing because White House aides, seemingly to obscure whether the President, who was once critical about another president playing golf, declined to say. “It’s the only place you can drive on the green, your own golf course,” a man is overheard saying on the video. “Thanks, fellas,” Trump said as he drove up, while the people behind the camera asked how Trump is doing. “Everything good?” Trump asked before driving up and soliciting a fist bump from one of the men behind the camera. “How are you hitting them?” a man asked. “Good, until this hole,” Trump says as the video cuts out. Is this a video of Trump golfing? The White House official traveling with the press in New Jersey that weekend refused to confirm whether Trump had been playing golf. This is par for the course for the Trump administration: White House aides regularly say Trump “may hit a few balls,” but Trump is regularly seen playing by reporters or guests at his golf clubs. Aides are sensitive to Trump’s golf habit given how he regularly slammed former President Barack Obama for golfing during his presidency. “President Obama has a major meeting on the N.Y.C. Ebola outbreak, with people flying in from all over the country, but decided to play golf,” he tweeted. “Can you believe that, with all of the problems and difficulties facing the U.S., President Obama spent the day playing golf. Worse than Carter,” he said. Trump’s critiques of Obama now could be thrust onto him, though. His golfing in New Jersey came on the weekend that three United States soldiers were killed and another wounded during a joint US-Afghan military operation in Afghanistan. The shooter in the June 20 incident was an Afghan army commando, Nangarhar provincial spokesman Attaullah Khogyani said. Trump’s aides — the same who would not confirm he was golfing — told CNN that weekend that he was getting continuous updates about the incident. « Donald Trump Can’t Even Follow The Rules AT GOLF!